From someone who ran miles away if any greens-based dish was served to someone who picks and chooses greens now,I have come a long way.Many more varieties to conquer,but for a start I am in love with Methi/Fenugreek leaves and Palak/Spinach.I like Drumstick leaves too,so there! I've always loved Kasoori Methi and made it a point to add it to any North Indian gravies for that delicate Restaurant flavor.I even made Methi chapathis out of it,now can't wait to try out the real thing.I am absolutely nuts over Methi Thepla,so if you've got a fool-proof recipe,please add the link in the comment box,Thank you! 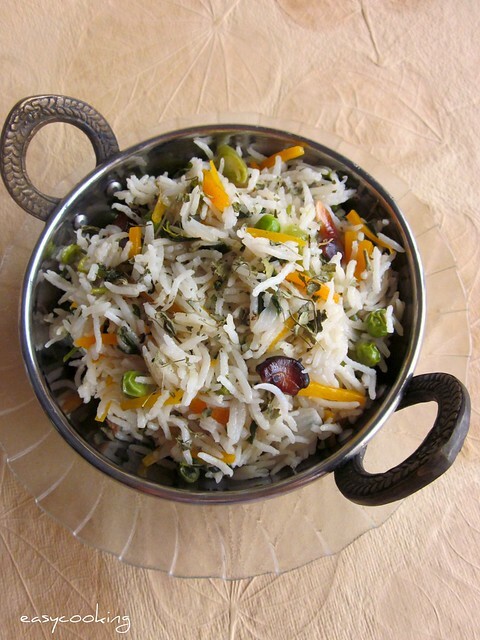 This Pulao is a small variation from the Methi Pulao I posted a while back.Ma-in-law made this for us while we were in Bangalore and I am a true-blue convert.The recipe is a mix of Vegetable Ghee rice and Methi Pulao--a perfect match! Wash the rice under running water for 2-3 times.Soak in enough water for 15-20 minutes.Drain and keep aside. In a pressure pan,add ghee/oil and saute the whole garam masala for a minute. Add the cashewnuts and stir till the cashews turn golden brown and then add onions,green chilly and ginger paste.Saute till the onions start browning. Mix in the vegetables-carrot,beans and peas.Saute for a minute and then add the chopped methi leaves.Stir till the methi leaves start softening. Mix in the rice and keep stirring till everything gets mixed well. Close the pressure pan and put the weight on,after the first whistle simmer for 3-4 minutes and then switch off the flame. Let it cool to room temperature and then open the lid and fluff with a fork. Sprinkle kasoori methi[if using] on top and serve with raita. How did we like it - To say we love it would be an understatement.So much so that this features in our lunch menu at least once in a week!Except for the cleaning part,I am game for this anytime.Other option would be to use the mini-bunch of methi leaves which are a breeze to clean. That's one aromatic rice dish..I am a big fan of methi and this pulao with methi sounds super yum. Love how fluffy each grain of rice is looking. I love this pulao..I do this regularly and sometimes I even add coconut milk instead of water...it tastes just amazing....the combo is just fantastic..
Fantastic,healthy and super inviting pulao..
Bajra flour : wheat flour - 2/3:1/3 cups. Knead to a soft dough using curds, if available. Since bajra is used, it is a bit hard to roll. We usually keep it between two plastic sheets and tap ( like puran poli) and prepare like parathas, using very little oil. This stays good for a week, and can be had with pickles and curd. If you can get bajra, you can also use besan. The ratio of flours is your option. I am aching for some methi now..Aww! Love the methi in the pulao, looks scrumptious! Love kasuri methi in any dish. hmmm rice looks very yummy and delicious. Same pinch :) Even I have fallen in love with kasoori methi and have been adding it to almost all my gravies. This rice looks so delicious :) The long basmathi rice is tempting too. What brand do you use? 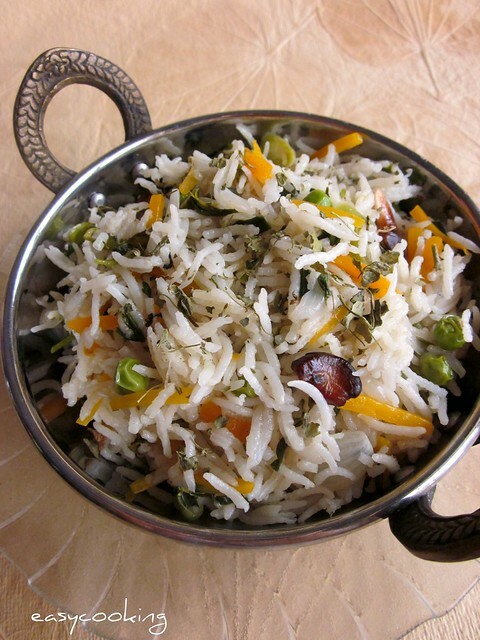 This methi pulao recipe sounds very yum... definitely going on my to cook list! Thank you, Divya. Like your blog and your pictures ! def. following you now! when you get a chance by by my blog and check it out and hopefully my writing will send you sparks so you can also become one of my followers too! I've been wanting to make this lately!!! Was looking for Methi Pulao and came across your blog. Dont believe I was not following you.. Love the recipe and even better the write up..